Prerequisite for the admission to a graduate study program is the successful graduation from a university. This qualification must be equivalent to a degree obtained in Germany. Please be aware that the equivalance of the foreign degree to a German graduation can vary from country to country. This means that in certain cases, the fulfilment of other prerequisits (e.g. APS) may be mandatory prior to the admission. Please enquire about the necessary requirements in time! If you have doubts whether your qualification is valid, do not hesitate to contact us. First you apply online with viaCampus. After completing the online application, a PDF is generated. The first page of the PDF-file is your application form. Print it and sign it personally! 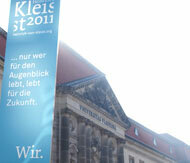 Additionally you have to send your application form together with all necessary documents paper based to the VIADRINA. Important: You will need additionally a permission by the faculty to start studying in a higher semester. Contact the respective study advisor and gain permission before starting the application process! This qualification must be equivalent to a degree obtained in Germany. The equivalance of foreign degrees to a German graduation can vary from country to country (see "Terms of admission"). Please enquire about the respective requirements. including the applied grading scale! Please check accepted tests and the respective requirements. Those proofs have to be submitted as an officially certified copy! The proof of your current German language skills must be submitted as an officially certified copy with all other application documents already at the time of application. The proof of the required German skills must be submitted as an officially certified copy or in original, latest at the time of enrollment. Accepted tests and the respective requirements differ according to your respective master program as well as the time for submission. Please check carefully! A simple non-certified copy is required. Must clearly show the passport holders name, date and place of birth as well as your signature. Be aware: Depending on the master program additional documents may be required. Please do not submit any original documents! Please send photocopies. Remember, the correct authorities must officially certify certain photocopies! Photocopies can be officially certified by a notary, by schools, or by universities. Photocopies have to be officially certified at a German consulate or by an authorized notary.